I love this time of year when we give our time and attention to remember the death and resurrection of Jesus and the power of the cross. The Gospel, which is very good news, was a result of everything Jesus purchased for us on the cross. This is the foundation of any mission assignment. This is why people leave family, friends, homes, and jobs (Mark 10:29-30)…because of the power of the cross-the power of the gospel. This gospel is worth sharing with a world so in need of a Savior. Recently I have started taking communion almost daily. Focusing on the broken body of Jesus and all that it represents for life and health in my body. His body was broken so we could be whole. I will receive His divine health into my body, celebrating the power of His sacrifice over infirmity. I let His cleansing blood wash me in new covenant realities. I will sit in the quiet of the morning before the house is awake and exchange with heaven. If I have fallen short, I will hand this to Jesus and I will receive His blood just washing and cleansing me because Jesus died to set us free from sin and all its effects (Hebrews 10:12). Then I will receive what He offers me in that place because He has purchased EVERYTHING we need for life and godliness (2 Peter 1:3). If there is something ahead in my day, I can receive by faith what I need inside of Him for that situation. He has it all. He purchased it all. Inside of Him is more than enough. My enemies (principalities and powers) have been thoroughly defeated at the cross. Because Jesus has triumphed we can reign in this life (Romans 5:17) This is good news! There is no grief or sorrow He did not carry; there is no curse He did not redeem us from (Isaiah 54:4). Because of His broken body and His shed blood, we are forgiven accepted, blessed and healed. This is good news! This is news worth sharing. This Resurrection (Easter) season, I invite you to prepare a communion table in the presence of your enemies (sickness, hatred, poverty, condemnation, impurity, disease, guilt, addiction, hopelessness, etc. = enemies of the cross of Christ) and proclaim the Lord’s death and resurrection (1 Corinthians 11:26). Declare what He has done for us through the power of the cross. It’s my goal to not merely look at the communion table as a ritual but as a declaration of faith – receiving by faith all that He purchased for me. 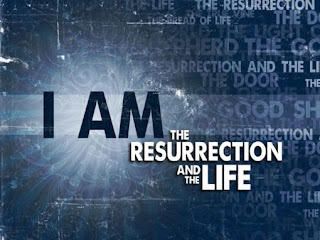 Happy Resurrection to you!